Learn more about Rory Harrison Here! 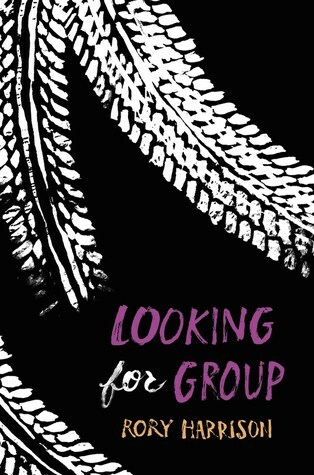 Read more about LOOKING FOR GROUP on Goodreads! Cover and Summary of the book are from Goodreads. Looking for group for the quest of a lifetime. Now that Dylan’s suddenly in remission, all he’s left with is a lingering OxyContin addiction and a hunger for something—anything—but the life he’s known. His only escape has been in the form of his favorite video game—World of Warcraft—and the one true friend who makes him feel understood, even if it’s just online. Dylan met Arden playing Warcraft, and now he wants to take her on a real mission, one he never thought he’d live to set out on: a journey to a mysterious ship in the middle of the Salton Sea. Dylan and Arden are two fun-loving teenagers. They like to talk for hours, they have their own inside jokes about the things that they love and they want nothing more than to explore some of the world’s great wonders. The only problem is, they only know each other through the computer screen. That is, until Dylan decides to make the trip to go visit Arden, and invite her on the trip of a lifetime; a quest to find buried treasure in a shipwreck that has never been found. But as the trip commences, the two friends realize they are fighting battles in the world that the other knows almost nothing about. This book was a road trip book, which I wasn’t quite expecting from the outset of the book itself, but I actually really grew to love it. It didn’t just jump in straight to the adventure, and it spent a lot of time setting up who these characters are and the situations they were in. Dylan is a cancer survivor, and he has to remind himself multiple times that he’s not in hospice anymore and that the cancer went away. Arden is a girl who is not supported in her own home. Both of these characters are incredibly lonely people who feel very misunderstood by those around them. They found companionship in one another through a game they both play on the internet. "I love the premise of LOOKING FOR GROUP, and I think the book does a great job commenting on parts of an online friendship brought into a more physical world." I wanted to read this book because of the premise of an internet friendship. In today’s day and age, I think a lot of people make friends online and at the same time, a lot of individuals frown upon this idea. Internet friendships are incredibly important. Just because of the way someone meets another person (whether through a game or in person) doesn’t make the friendship any less of a friendship. I love the premise of this book, and I think the book does a great job commenting on parts of an online friendship brought into a more physical world. There’s one scene that illustrates this very well, when Dylan is meeting Arden for the first time. He finds it hard to speak with her, because the only time they spoke was through the computer. I can’t help but imagine that with people meeting their friends for the first time, there is bound to be some awkwardness and navigation of the waters, but that’s quickly overcome once both of you realize that the person you’ve been speaking to for years is right in front of you. I found that passage in particular to be incredibly powerful. Speaking of Dylan’s voice, it was extremely easy to follow through the entire story. The formatting of the pages were a little strange (there were large blank sections after each paragraph) but his voice flows wonderfully. The book is written so Dylan is almost “speaking” to the reader, which is something that meshes really well with me. I also really enjoyed how Dylan didn’t assume his reader had knowledge of World of Warcraft, and every analogy he made was explained. He explained why certain parts of the game were special to him, some of the places within the game, how the mechanics of the game functioned and even the game itself. As a reader, I was never left out on their inside jokes. Granted, there were still some pieces of the game I didn’t understand, but in terms of context of the story, I thought World of Warcraft was adequately described to and for someone who has never played it before. Not having knowledge of the game won’t hinder your understanding in any way. I did feel at times that the book dragged, and a lot of the “conflict” in the book was just introduced for there to be some disagreements, only for it to be “resolved” three pages later. I also didn’t like how most of the arguments and disagreements Dylan and Arden had were never really discussed, and left behind for the sake of continuing the journey forward. Dylan could make a joke, and suddenly everything would be okay, leaving what they argued about almost completely undiscussed with no apologies for things done wrong. I didn’t like how that was handled, nor did I like that it happened more than once. Relating to this point, I wanted to mention as well that a lot of Dylan’s actions toward Arden are very transphobic. Arden’s father is abusive, and Dylan encourages her to go back into an environment that doesn’t support her. Now, when I read it, I support the notion that people can change, and maybe Arden’s father realized the error of his ways and stopped his abuse, but as a reader, we don’t actually get to realize if that’s true (and that also doesn’t mean the scars from abuse in the past disappear). There is never a good reason for putting anyone into an abusive home, and a large theme of the book focuses on Arden’s desire to start her own life without the abuse following her wherever she goes. So to end on a note where Arden’s abuse could be continued doesn’t sit right with me. Dylan also continuously misgenders Arden under the guise of “protection,” and he doesn’t change his outlook upon things after being made aware that misgendering is an issue, and that is something that also doesn’t sit well with me. Overall, this book was a quick read. LOOKING FOR GROUP follows two friends trying to escape the negatives in their lives, and for once, truly live; by this time, taking their adventures to the real world. The premise of an internet friendship hooked me instantly, but the transphobic and harmful actions in this book are things I cannot overlook.